Without a tie, men lose the biggest opportunity to express themselves easily in colour and pattern. But I don’t like wearing a tie every day either. The key if you’re not going to wear a tie is to add accents elsewhere, such as in a pocket handkerchief and a sweater. It’s often only with the second addition, such as with that knitwear, coloured socks or an unexpected shoe, that you really compensate for the central absence of the tie. The suit is from Toby Luper at Hemingway Tailors. It has the strongest shoulders I’ve ever had in a suit, achieved not so much from extra padding as from the cut, chest canvas and strong roping in the shoulder. The roping is about ⅝ of an inch in width. It’s fair to say this is Toby’s normal style – though he is not a cutter himself, rather a travelling tailor using Cheshire Bespoke to make his suits. I find it interesting how much influence a tailor like Toby has on the style and cut of suits made elsewhere though. His trousers really deserve the attention in this suit; as with previous pairs, they are the best cut of any I own. The sculpted line into the lower back is just perfect. I may yet have the shoulders altered. But continuing the thoughts of a previous post on sloping shoulders, it’s interesting to see perhaps the most extreme way of dealing with them – cutting a near right angle around the circular shoulder line. I’ll wear it in for a while and see how it feels. French navy flannel suit, Hemingway Tailors; white polo shirt, Kiton; grey sleeveless sweater, Loro Piana; brown suede shoes, Edward Green; royal blue linen handkerchief, Pochette Square. You can follow the discussion on Going tieless; Hemingway Tailors suit by entering your email address in the box below. You will then receive an email every time a new comment is added. These will also contain a link to a page where you can stop the alerts, and remove all of your related data from the site. I generally dislike going tie-less, as I think if a suitation is formal enough to make you want to wear a suit, you should wear a tie, and if it’s not formal enough for a tie, then don’t wear a suit. BUT you do look good here. You’re right about the handkerchief and sweater, they work harmoniously and ALMOST make up for the loss to texture and colour at that central point of your outfit. I would consider wearing a shirt an inch or so smaller in the collar if you’re intentionally wearing it open-necked – it’s “sits” better and doesn’t flop around so much. Thanks DW. ‘Flopping around’ is to do with the stand, construction and height of the collar. See previous post on tips on shirts. In this case, however, it is a hand-attached collar from Kiton, which is handsewn in the round to always maintain that shape. I am always in favor of utterly padless shoulder in a suit but then again i have big square shoulders. Having said that, I think this is, by far, you most flattering silhouette. well done. A very nice suit. Is this from Hemingway’s bespoke or made to measure service? To repeat what I have written in several other places (because I dislike the look so much) to me any jacket with lapels worn with an open-necked shirt looks sloppy and unfinished. A sports jacket, blazer or suit demands a tie 90% of the time; a fine roll-necked jumper is acceptable under a tweed jacket, and that is that! The shoulders are quite unusual but compliment the cut of the suit. A perfectly tailored 2 piece suit in my opinion. How much did you pay? 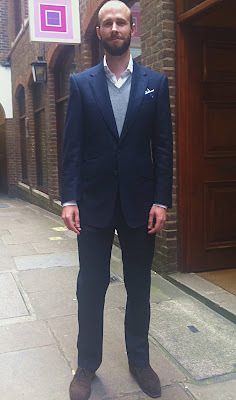 I am thinkging about getting a tailored suit from Hemingway in Knightsbridge. The comments about strong shoulders have put me off a little. Can you ellaborate on the final suit for me to help me in making my decision. Thanks Simon. I think im going to pass. Just to let readers know they are doing a groupon voucher for a bespoke suit at the moment. Is this the Hemingway tailors who do discount offers on groupon etc? tailor made for about £400 on discount? Do you have any experience with John Pearse in soho? No, sorry Luke. I’ve met him once or twice but never had anything made there.